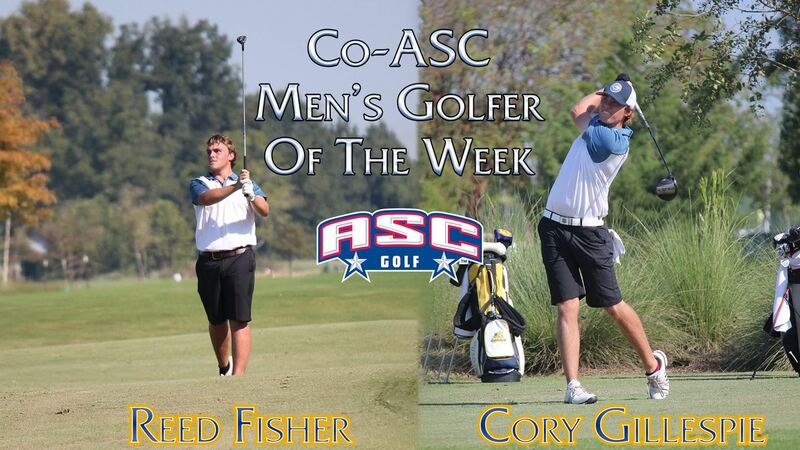 Cory Gillespie, Reed Fisher Named Co-ASC Men’s Golfers of the Week. RICHARDSON, Texas – LeTourneau University men’s golf juniors Cory Gillespie and Reed Fisher have been named American Southwest Conference Co-Men’s Golfers of the Week for their performances at the Rhodes College Spring Collegiate Classic in Germantown, Tennessee on April 15-16. Both Gillespie and Fisher would tie for 10th in the meet after posting 54-hole totals of two-under par 214 for the tournament. Gillespie would hang around in the top-10 all tournament long by posting scores of 70-71-73 on the par-72 course while Fisher would shoot 75-67-72 with the five-under 67 tying the low round of the competition. Gillespie is a native of Durango, Colorado and is the son of Jackie and Tracey Gillespie while Fisher is a native of Longview, Texas and is the son of Paige and Mike Williams. LeTourneau Softball Series At Ozarks Pushed Back To Friday/Saturday. 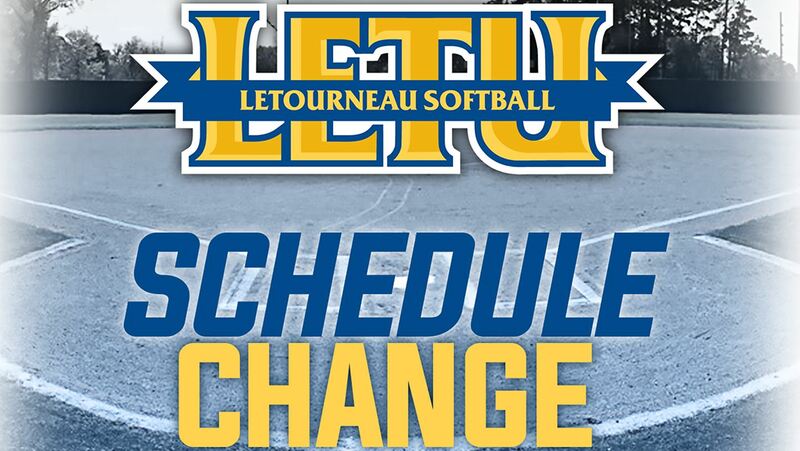 LONGVIEW, Texas – Due to the threat of potential inclement weather in the Clarksville, Arkansas area this on Thursday, the LeTourneau University road softball series against the University of the Ozarks has been moved back one day and will now begin on Friday, April 19. Friday will feature a 2:00 pm doubleheader against the Eagles, with Saturday consisting of one game beginning at noon. The three-game series will serve as the regular-season finale for the YellowJackets, as LETU has a bye-week in the final week of the conference schedule. Any additional schedule changes regarding LeTourneau University athletic events this weekend will be announced as they happen. Fans should check www.letuathletics.com for the latest regarding any schedule changes for all of LeTourneau’s 17 varsity sports. LeTourneau Softball sweeps non-conference doubleheader from the University of Dallas. LONGVIEW, Texas- Getting a break in American Southwest Conference action, the LeTourneau University softball team extended their win streak to five in a row as they took down the University of Dallas by scores of 9-1 and 3-1 in a non-conference doubleheader on Tuesday, April 16. The YellowJackets improve to 22-13 on the year while the Crusaders drop to 7-28 on the season. The Crusaders struck first in the opening as they used two hits in the top of the second inning to bring across the first run of the day and grab a 1-0 lead over the YellowJackets. The LETU offense wasted no time tying things up when a Taylor Nichols single brought in Katelyn Trombley from third base. LeTourneau added to their total again in the third after a single from Haydn Parker and an RBI double from Ethel Warren made it 4-1. Macey Mize extended the lead to four in the bottom half of the fourth off a two-out RBI double to right field, giving the YellowJackets a 5-1 lead heading into the final two innings of action. 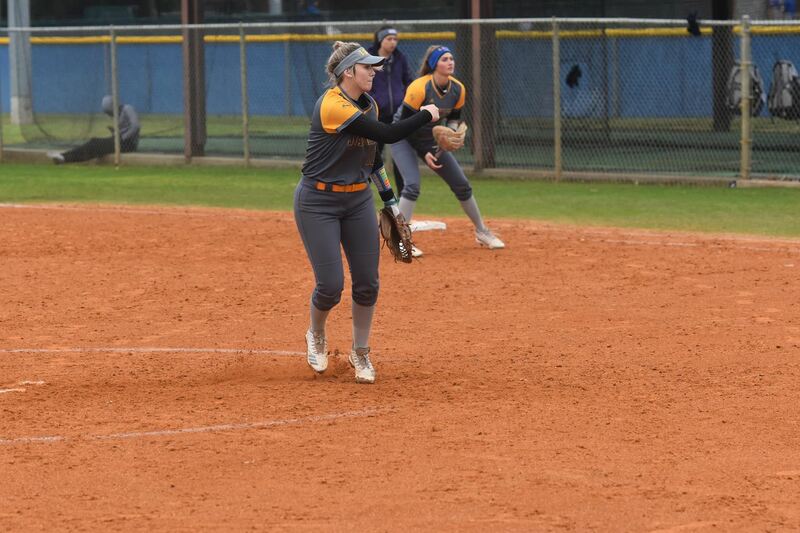 The fifth would be no different for LETU as Nichols singled through the left side to bring home Trombley and freshman Brianna Diaz sent a two-RBI triple down the right field line to put the YellowJackets on top 8-1. Looking to end the game in the sixth, Mize posted a sacrifice fly to center field to score Kennedi Dillow from third and put the Crusaders away, 9-1 due to the eight-run mercy rule. Leigh Luker earned her sixth win of the season in the circle for the YellowJackets, allowing just five hits while striking out two batters. Dillow, Trombley, and Nichols each had a team-high two singles in the contest while five other YellowJackets recorded one. LeTourneau struck first the second time around when Parker sent an RBI single to center field to score Emilee Anderson and give the YellowJackets an early 1-0 lead. The Crusaders tied things up in the top of the third after a one-out RBI single brought a run across to knot things at 1-1. The YellowJackets would use two hits and a throwing error by the Crusader defense to score Silver Montgomery and re-take the lead at 2-1 heading into the fourth. Warren would be the final player of the day to record an RBI as she hit an infield single to score Kimmy Baker and give the YellowJackets a 3-1 lead. The Crusaders only managed to find one hit in the final two innings of play as a stout pitching performance by the YellowJackets would finish out the game to earn a two-run victory. Samantha Akers earned the win in the circle, allowing just six hits and one run in her complete-game performance. Parker and Haley Claterbaugh each had a team-high two hits in the game while five other YellowJackets added one. The YellowJackets will return to action for their final American Southwest Conference series of the 2019 season as they travel to Clarksville, Arkansas to take on the University of the Ozarks in a three games series that is scheduled to begin at 4:00 pm on Thursday, April 18. The two teams will then close things out with a doubleheader on 2:00 p.m. doubleheader on Friday, April 19 as LETU will close out the regular season on the road. LeTourneau Men’s Golf Finishes Fourth At Rhodes College Spring Classic. 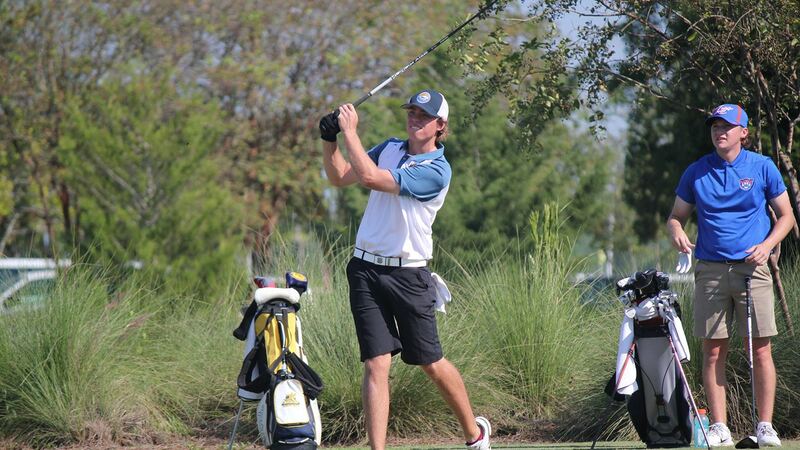 MEMPHIS, Tenn. – Posting a final round 293, the LeTourneau University men’s golf team finished in fourth place at the Rhodes College Spring Classic held at Windyke West Country Club in Memphis, Tennessee on Tuesday, April 16. LeTourneau’s three-round total of 866 would 21 shots back of runaway winner Berry College who would win the 16-team meet by 13 strokes. The second place the University of Dallas would shoot a final-round 285 to finish with a total of 858 while Sewanee finished in third with a total of 861. All three teams to finish ahead of LETU are currently ranked in the top 50 of the Golfstat NCAA Division III rankings while the YellowJackets beat out number 41-ranked Webster University and number 17-ranked Rhodes College. Pacing LETU would be juniors Reed Fisher and Cory Gillespie as the pair would both finish the two-day meet in a tie for 10th with totals of 214. Fisher would shoot a final-round even-par 72 by collecting his only birdie of the day on the par-four 16th while Gillespie posted three birdies and four bogeys to finish with a one-over 73. Freshman Wes Nolen also found himself inside the top-20 after the meet after firing a final-round 74 to finish with a 54-hole total of 217 which was good enough for a tie for 19th. After starting with two bogeys on his opening four holes, Nolen managed to birdie three of the next five holes and battle his way back to even-par before closing out his round with a pair of bogeys. LeTourneau would also have Dalton Northcutt and Landon Oney compete in the meet, with Northcutt finishing in a tie for 38th after a second-straight round of three-over 75 to finish with a 223 total while Oney tied for 43rd with a 224 total after a final-round 76. LeTourneau will now have two weeks of preparation in advance of the 2019 American Southwest Conference men’s golf tournament which will take place April 28-30. The meet will take place at Comanche Trace Country Club in Kerrville, Texas, and will feature 18 holes each day throughout three days on the 6,988-yard, Par-72 course. Katharine Waldthausen Named ASC East Women’s Tennis Player of the Week. 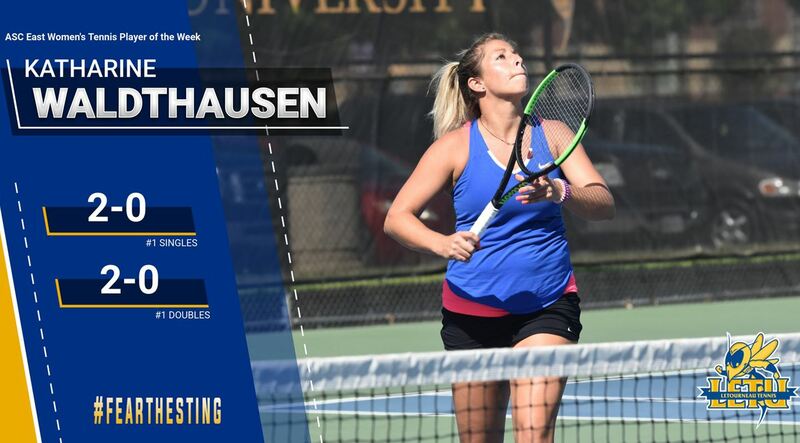 RICHARDSON, Texas – For the second time this season and the second time in her career, LeTourneau University women’s tennis player Katharine Waldthausen was named American Southwest Conference East Division Player of the Week for her performance during the week of April 8-15. Waldthausen went 4-0 on the week at No. 1 singles and doubles by picking up wins at the University of the Ozarks and against Texas-Tyler. In her first match of the week, Waldthausen defeated Ozarks 6-1, 6-4 to go along with an 8-1 win at number one doubles with Maddison Brackenreg. The duo would then team up for an 8-5 victory over Texas-Tyler before earning a 7-6 (7-5), 6-3 win in singles play over the Patriots. A political science major at LeTourneau University, Waldthausen is a native of Konigstein, Germany and is in her first season with the YellowJackets. 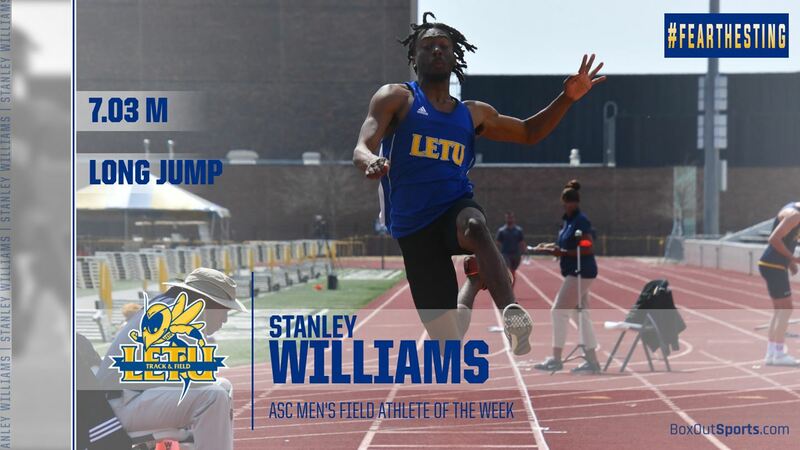 Stanley Williams Named ASC Men’s Field Athlete of the Week. RICHARDSON, Texas – The American Southwest Conference for the first time this season, and the first time in his career, named LeTourneau University men’s track and field sophomore Stanley Williams the Men’s Field Athlete of the Week for his performance at the East Texas Invitational in Commerce, Texas on April 11-12. Williams set two school records and was part of a third record-setting performance for the YellowJackets as the Longview, Texas native started the weekend by taking third in the long jump with a mark of 7.01 meters (23 ft.). The score is currently the 16th-best mark in NCAA Division III this season. Williams would go on to run a time of 11.03 in the 100 meters and be part of the 4×100 relay team that ran a time of 42.98. The son of Stanley and Tomikah Williams, Stanley is majoring in biology at LeTourneau University. LeTourneau Athletics Inducts Four New Members To Hall of Fame. 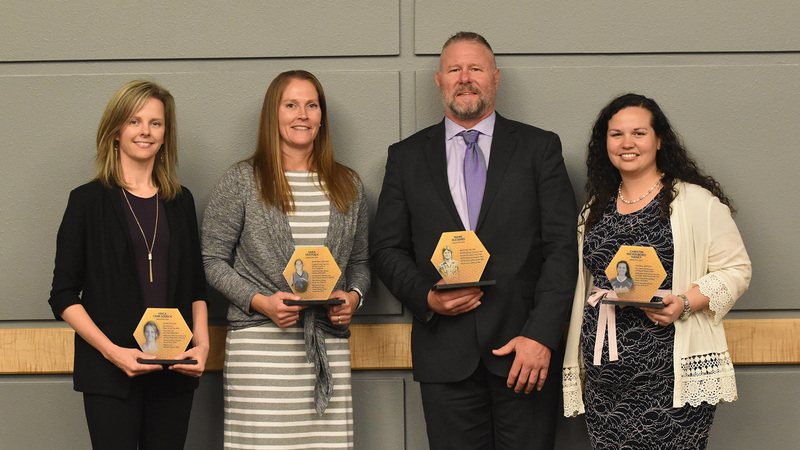 LONGVIEW, Texas – Honoring those that competed at the highest level in their sport, the LeTourneau University Athletic Department inducted four new members to the Hall of Fame on Saturday, April 13, 2019. LETU Athletics Hall of Fame named Leslie Lee and Nicole Leman making the 2019 class the second class since 2005 and the first since 2017 to be inducted. To be considered for selection, the candidates must have received significant athletic recognition at LeTourneau University in at least one sport. They must also be five years removed from participating in the LeTourneau University athletic program. Character and integrity of the student-athlete are of the utmost importance as it relates to recognition of any candidate to the LeTourneau Athletics Hall of Fame. The induction class of 2019 included Sara Vestfals of women’s basketball, Christin Mickelboro Haney of softball, Mark Blessing of wrestling, and Erica Crim Sudeck of women’s soccer. Vestfals was a multi-sport athlete for the YellowJackets, excelling in every sport that she played. After spending one year at Ranger College, Vestfals came to LeTourneau to play women’s basketball and would also compete in women’s soccer and softball. Vestfals finished her women’s basketball playing career third all-time at LETU in rebounds (725), number two in career blocks (97), number two in field goals made (481), and number three all-time in scoring (1,256 points) while being named a three-time American Southwest Conference All-East Division, a Second-Team D3hoops.com South Region selection in 2002-03, and 2002-03 ASC Scholar-Athlete of the Year. Serving as a goalie for the LETU women’s soccer team, Vestfals would finish her career number four all-time in career wins at LeTourneau (four), and number 10 all-time in saves (82) after playing just two seasons on the pitch. One of the most decorated softball players in LeTourneau history, Haney helped lead LETU to their most wins in program history in 2011 (22), a record that still stands today while holding nine career records at LETU. Haney still holds the career record for batting average (.416), runs scored (108), hits (182), RBI’s (137), doubles (43) home runs (30) on-base percentage (.491) slugging percentage (.744) and walks (60) while also holding the single-season record for batting average (.491), slugging percentage (.887), doubles (16), hits (52), home runs (10), RBI’s (43), on-base percentage (.559) and total bases (94). A three-time All-ASC East Division First-Team selection, Haney would also be named National Fastpitch Coaches Association All-West Region three consecutive years (2010-2012) and an NFCA Second-Team All-American in 2010. Blessing became the fourth LeTourneau University wrestler to be inducted into to the LETU Athletics Hall of Fame, joining Stan Watne (1972-76), Ross Beans (1973-78), and his former coach Roger Kieffer (1972-76). Blessing wrestled for the YellowJackets between 1981 and 1985 and was a two-time National Christian College Athletic Association National Champion (1982, 1984) while finishing second in 1985 and third in 1983. During his four-year career on the mat, Blessing would win his weight class in over 20 tournaments and won first place in the Texas Open Tournament three consecutive years after finishing his collegiate career (1987-89). The blessing would also serve as a player/coach during his final two years, helping keep the wrestling program alive and allow those in the program to finish their collegiate careers. Crim enters the LETU Athletics Hall of Fame as the first women’s soccer student-athlete ever to be inducted in the program’s 20-year history after a stellar four-year playing career that took place in the early years of the program. The 2006 American Southwest Conference Offensive Player of the Year, Crim would be a three-time ASC First-Team Selection (2004-06) and was a 2006 National Soccer Coaches Association of America Second-Team All-West Region selection. With Crim, LeTourneau would make the American Southwest Conference women’s soccer tournament for the first two times in school history and still holds the career record at LeTourneau for points (105), goals (44) shots attempted (274) and assists (17).